Over the New Year holidays, I took a bit of time to go to a few places that I had been meaning to visit. 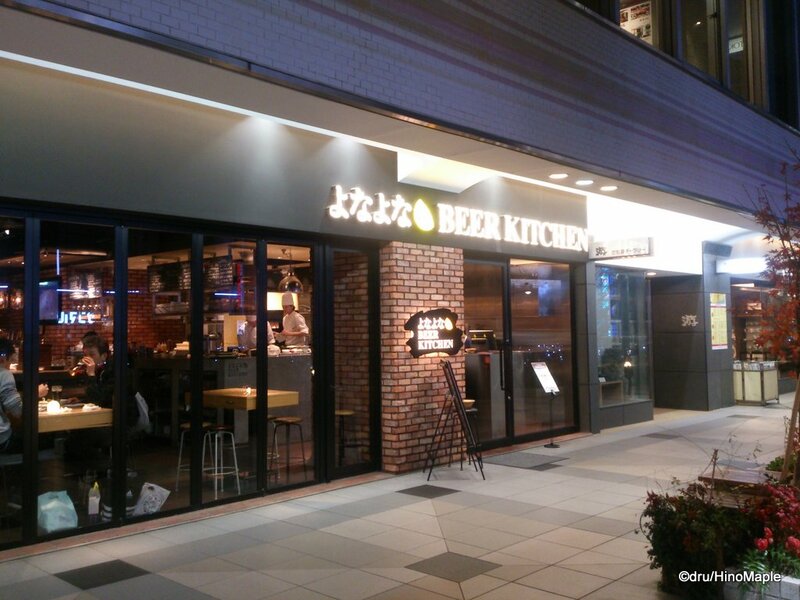 The Yona Yona Beer Kitchen is one such place and I had a great time there. It is a nice upscale place that is pretty inviting. The prices are a little high for my own tastes but the quality of the food and drinks is pretty high as well. It was also a lot busier than I had expected. Being the main taproom for Yo-ho Brewing, makers of Yona Yona Ale, they did a great job with this. Getting to the Yona Yona Beer Kitchen is not so easy but once you do find it you wonder why it was so hard. It is in a very high density area for train stations. The closest ones are Akasaka-Mitsuke and Nagatacho. I came from Nagatacho and the exit lead me straight to the restaurant. 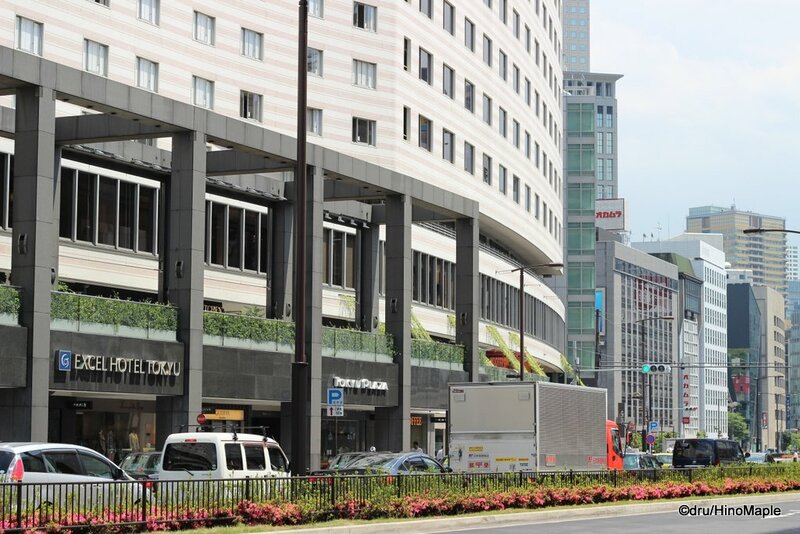 It is on the second floor of the Tokyu Plaza Hotel. There are several other restaurants there, but notable ones include the first Hooters in Japan as well as a ninja restaurant. I haven’t been to the ninja restaurant but I guess that Yona Yona is the best one. Once you go inside, the atmosphere is inviting and a little modern. There are nice wood accents and wood tables but a lot of concrete and steel as well. I felt as if I was in an upscale N. American restaurant rather than Japan. The food on the menu reflected this too. 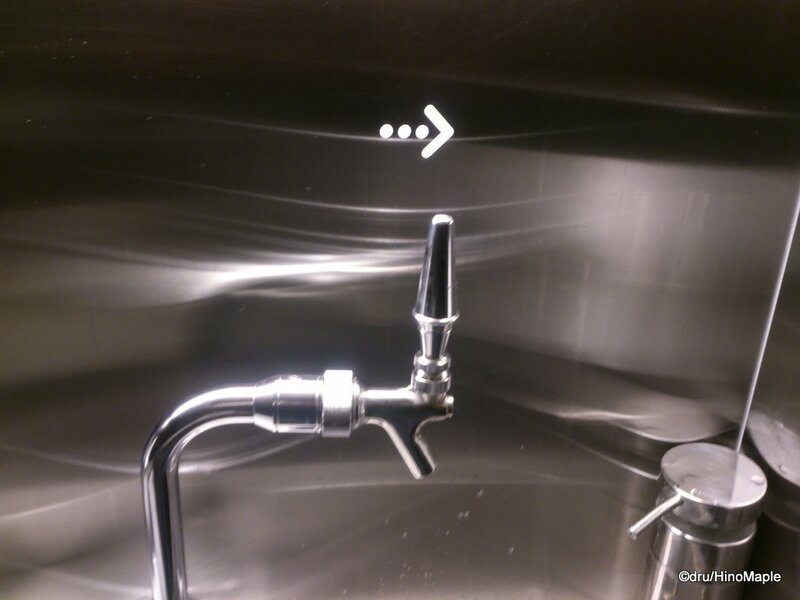 The washrooms were also very interesting as everything was covered in brushed steel and the water faucet was an actual beer tap. The bar, which is where I sat, was great. It was made of concrete and although it can be cold it was very warm. I really enjoyed it and never felt uncomfortable sitting at the bar. The beer is the most important thing for me, so let’s start there. Yona Yona has all of their beers on tap and usually 2 seasonal beers too. They had the standard Yona Yona Ale as well as the Tokyo Black in both regular tap and hand pump real ales. The real ales are a little unique and Ya-ho specializes in this. You can see their Yona Yona Real Ale in many bars and their Tokyo Black Real Porter in specialty bars too. They also had other common beers but when I go to beer bars these days I want the specialty beers, not the regular line-up. 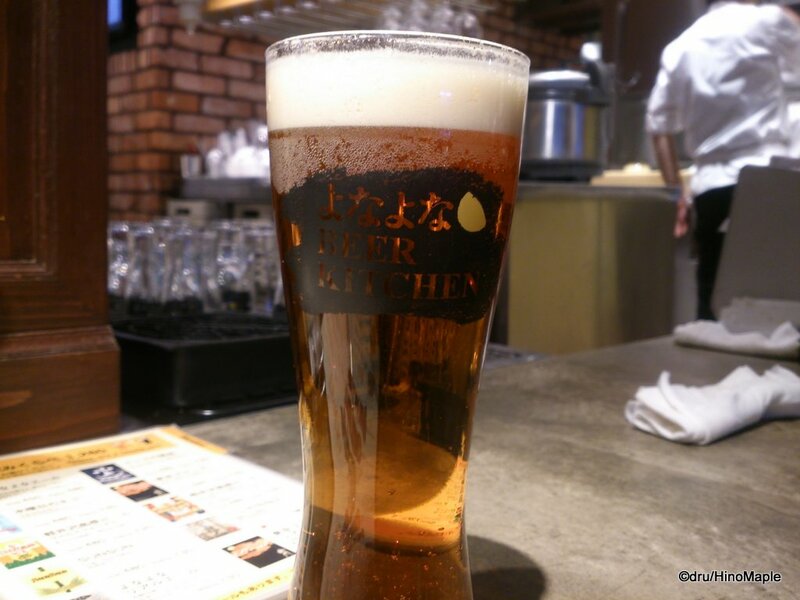 I started off with a seasonal, the Karuizawa Kogen Beer – Seasonal British Pale Ale. Karuizawa Kogen Beer is a completely owned subsidiary of Ya-ho Brewing and I’m not sure if there is any difference to the companies at all. The beer was a standard British Pale Ale and it didn’t let me down. For my second beer, I had the Aooni IPA which is my favourite from Yo-ho. I rarely have it on tap so I had to try it on tap. It wasn’t better than in the can but it was still very good. I then had the special Getsumen-gaho月面画報 which is having a special deal with Amazon. Getsumen Gaho is only available on Amazon but you can also buy it on tap at Yona Yona Beer Kitchen. The beer was nice and it was as a Belgian Pale should be; it has clear banana notes in it so be aware that if you don’t like bananas, you won’t like this beer. The food was also great. I started off with the horse meat tar tar. Sorry Ru but I do eat your beloved horses. I am ready for your attack though. By the time this is online and you read this, I should be out of Japan with a head start long enough to keep going. I think their signature dish is the roast chicken. They have it in original and spicy. Being me, I had to get the spicy flavour and it was spicy but not spicy enough for me. The spices did complement the chicken and the beer that I was drinking. 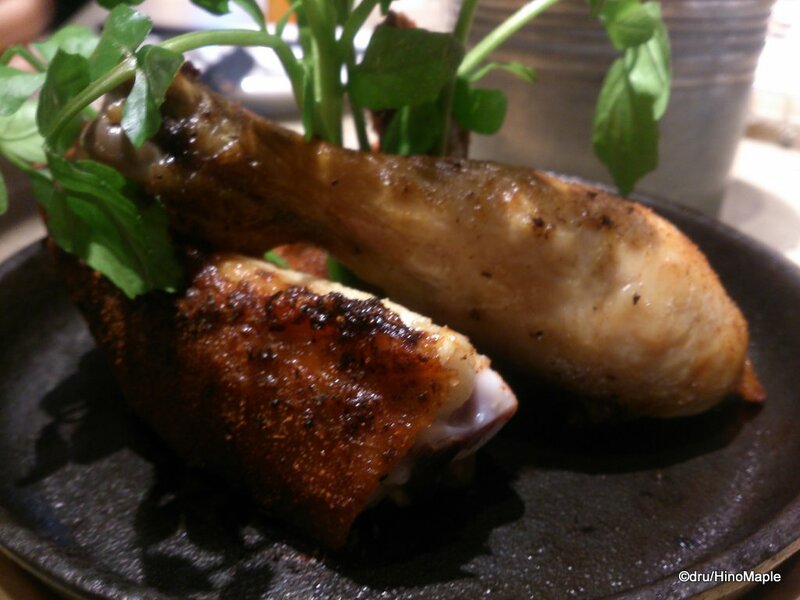 The best dish for me was the sansho sausage. I’m on a big sansho binge these days as this Japanese peppercorn is spicy but delicious. If you are in the mood for something a little different, I suggest you try it. 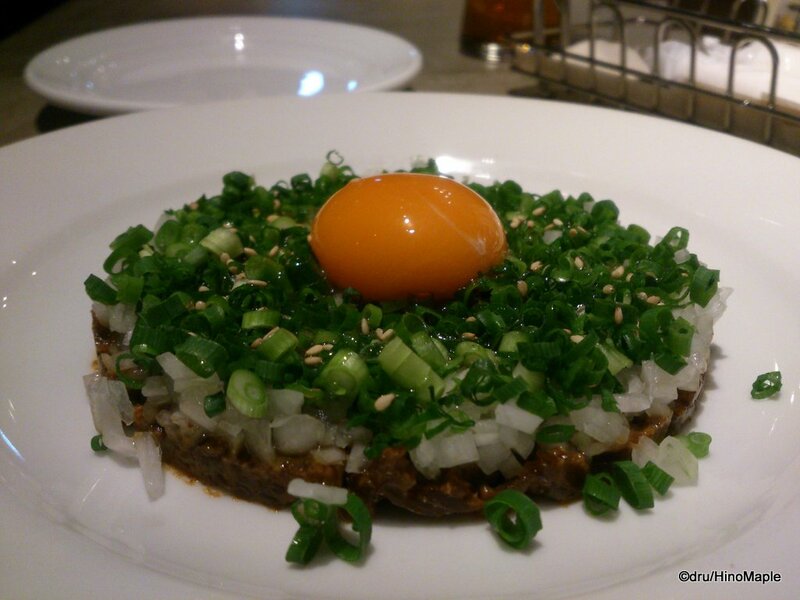 With a good combination of food and beer, Yona Yona Beer Kitchen is a great place to visit. It will break the bank unless you have a well-paying job but sometimes you need to go out and splurge a little. I really had a good time and I will go back again, but I may try to make reservations beforehand as it can be a little busy there. 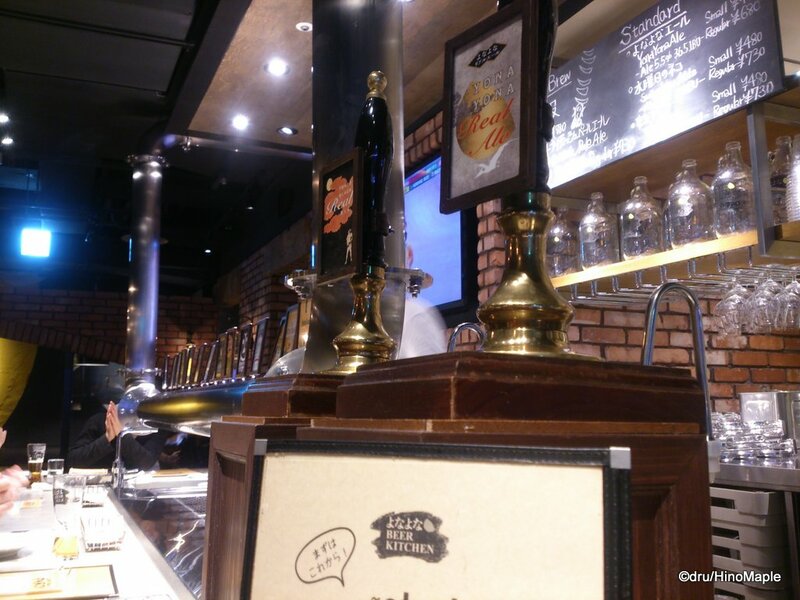 This entry was posted in Tokyo Food and tagged Akasaka, Akasaka Mitsuke, Aooni IPA, beer, craft beer, japan, Nagatacho, restaurant, tokyo, Yo-ho, Yo-Ho Brewing, Yona Yona, Yona Yona Ale, Yona Yona Beer by Dru. Bookmark the permalink.